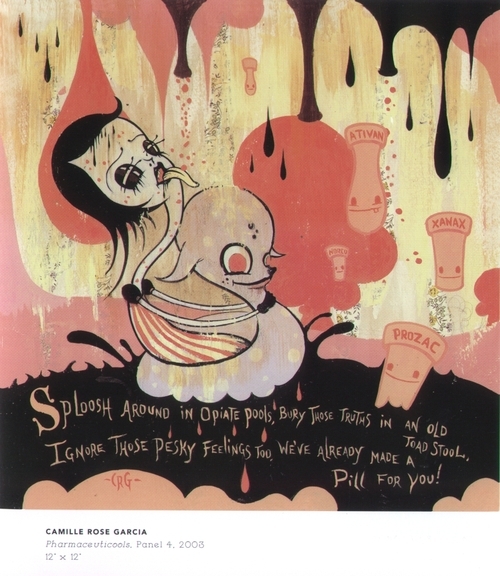 Anyone who’s picked up an issue of Hi Fructose, Juxtapoz or any other modern/pop/whatever art magazine lately is no stranger to the work of Camille Rose Garcia. She’s constantly producing and always reinterpreting her vision while her unique style remains a common thread. Also, if you’ve paid any attention to art and followed the ripples outward to craft and street fashion, you know she’s inspired a sea of attempted imitators as art in semi-mainstream press is known to do. If, however, she was under your radar seven years ago (I believe she was either under mine or just getting picked up), you may have missed her four part spread in Blab! 2003. It was a series on our drug centered approach to depression in American culture. Here is panel 4. I’m pretty sure her prints were out of my price range by the time anyone cared enough to press them but I would love to have gotten my hands on these. Who knew our feelings-damning, pharmacentric culture could be so visually appealing? Also, on the topic of drugs and the places they take you, Check out the her take on illustrating Alice’s Adventures in Wonderland (scroll up and click her name to get to her website). If you’re on the west coast, you may be able to attend a book signing in march. It’s common practice in prescribing medicine to offer drugs for reasons other than their FDA approved purposes. This off label prescribing of drugs is nothing new and while we’d probably like to think doctors are prescribing drugs off label in a judicious and well thought out manner, that doesn’t seem to be the case. As it turns out, according to a University of Chicago study, more than 40% of prescribing doctors do not even know the approval status of drugs in relation to their indications. When the study was limited to drugs they’ve prescribed in the past year, the increase in knowledge was marginal at best. Psychiatrists demonstrated a greater knowledge of approval status than primary care physicians. This doesn’t mean they are more reserved in off label prescribing, just that they know better. You’d think that for a doctor’s salary you could expect them to do their homework, really know about the drugs they are so quick to dispense, and while it’s not limited to psych drugs its impact is substantial in that market. Drugs are approved based on efficacy and safety, basically a risk vs benefits scale. With such lax FDA standards, if a drug doesn’t gain approval, it is either highly ineffective, alarmingly dangerous or both. Most antipsychotics just squeak by but despite this the numbers for antipsychotics being prescribed in recent history have skyrocketed — and it’s not because more and more people are becoming psychotic. Antipsychotics have seen such an increase in numbers that they’ve beaten out the old champion, lipid regulators, as of last year thanks to a more than 50% growth in sales over the course of four years. It just might have something to do with companies like Eli Lilly, who illegally marketed their antipsychotic Zyprexa off label for bipolar and dementia, for which it is not only not approved but proven ineffective. For a drug approved only for “diseases” that a relatively small part of the population are diagnosed with to beat cholesterol drugs in our Big Mac nation says more about marketing than it does about mental health. The level of disregard that such dangerous marketing implies is deplorable and the fact that doctors aren’t even putting the work in to know which drugs have which approvals is astounding. Even a small number of doctors not demonstrating a working knowledge of the drugs they dispense is shameful but to know that the numbers are nearing and in some accounts exceeding half — that’s frightening. We’re not talking about cold medicines here with side effects like drowsiness and upset stomach but drugs that often shorten lives by way of metabolic syndrome, stroke, heart failure and decrease quality of life in any number of ways for a lot of people. If you are a potential patient/consumer, do your homework. It’s entirely possible your doctor hasn’t done his.